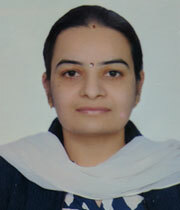 Anuradha Sharma is an Associate Professor in the Department of Mathematics at IIIT-Delhi. She received B.Sc. degree with Honours in Mathematics, and M.Sc. and Ph.D. degrees in Mathematics from Centre for Advanced Study in Mathematics, Panjab University, Chandigarh, India, in 2000, 2002, and 2006, respectively. She was awarded University Gold Medal for standing first in M.Sc. Prior to joining IIIT Delhi, she has worked as an Assistant Professor in the Department of Mathematics at IIT Delhi for around five and a half years and as an Assistant Professor in the Centre for Advanced Study in Mathematics, Panjab University, Chandigarh for around three years. At IIT-Delhi, she received the Kusuma Outstanding Young Faculty Fellowship. Currently, she is working in Algebraic Coding Theory. Her other research interests include Number Theory and Algebra. She has over 35 papers in reputed international journals including but not limited to Finite Fields and Applications, Discrete Mathematics, IEEE Transactions on Information Theory etc. Her Erdős number is 3. Number Theory, Coding Theory, Algebra, Linear Algebra, Combinatorics, Real and complex analysis, Topology.